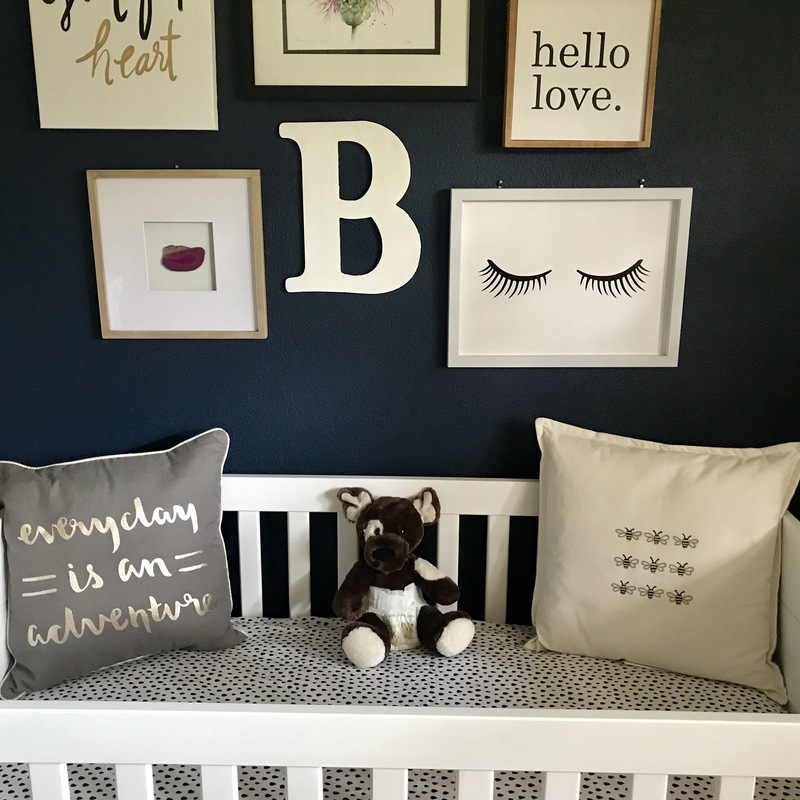 One of the fun things about prepping for a kid is coming up with a nursery theme. I must admit, I already know I’m not a traditional style mom; mostly because I’m not a traditional style person. 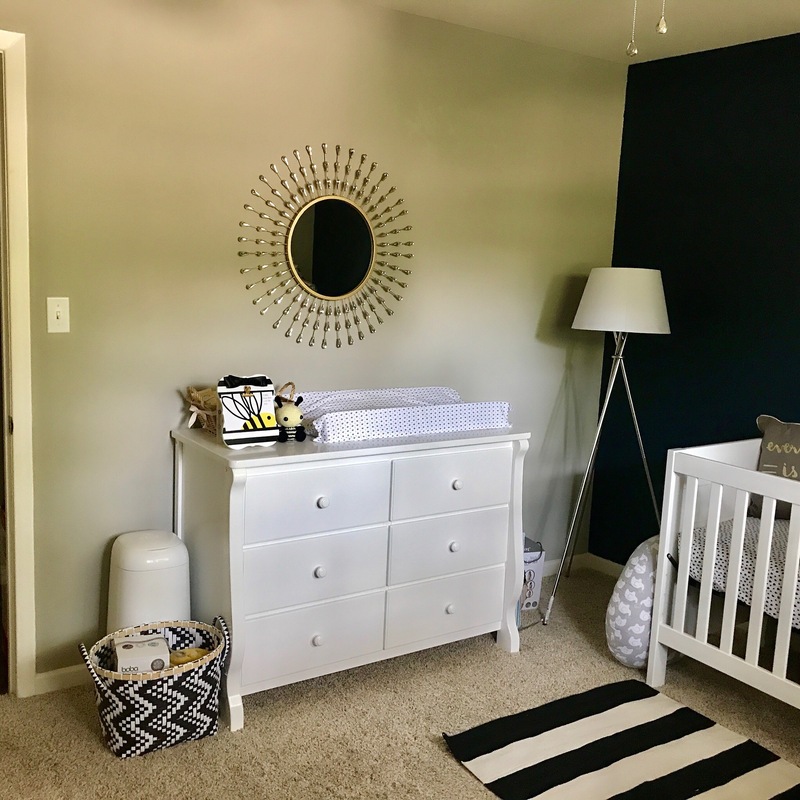 I don’t like a lot of fluff and I knew I wanted our daughters room to resemble bold color, mod design, and minimalist tastes rather than some of the nurseries I have seen (not that that’s bad, I just like different style). 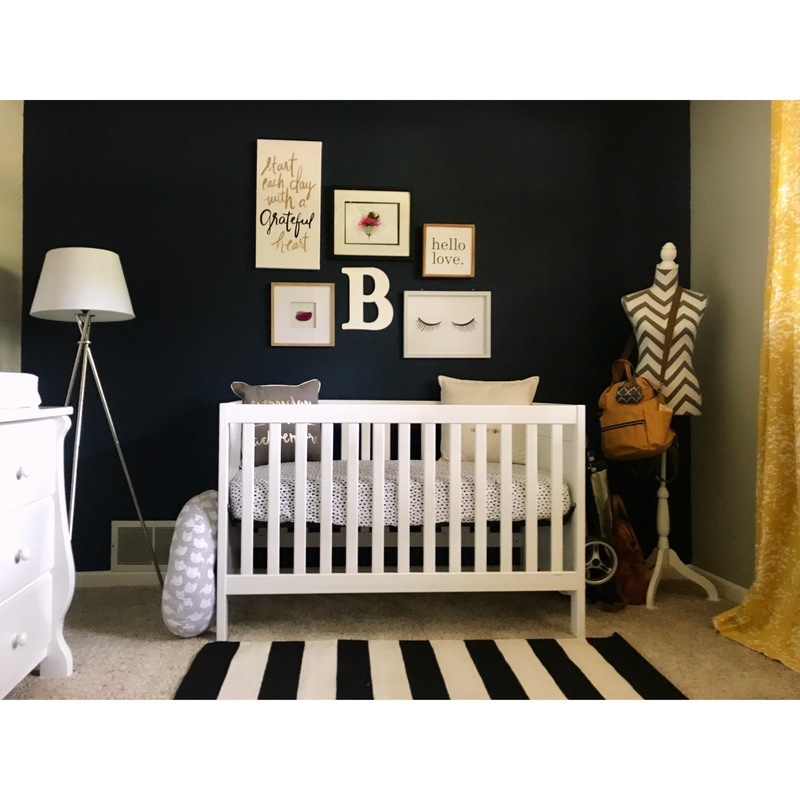 Before starting to shop, I took to Pinterest combining several inspirational looks until it birthed this bee themed “Tomboy Glam” inspired room. It’s a room for sneakers and skirts, frayed jeans and feathers, glitter and grunge. I was a tomboy as a kid, so I figured best to start there and let the little one grow into her own style. What I enjoy most about this room is that it’s simple and to the point. There is function, but it also has personality. 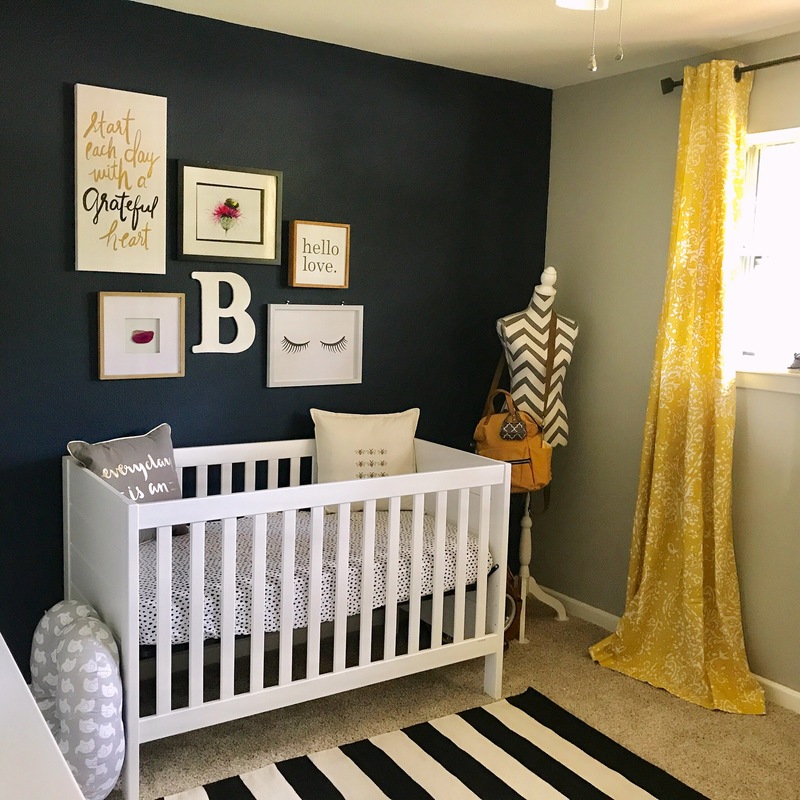 It’s a room that can mature with our daughter so that as she grows up, she won’t outgrow the room so quickly. Let me take you on a tour…. Of course knowing me I couldn’t have just ANY baby changing station. 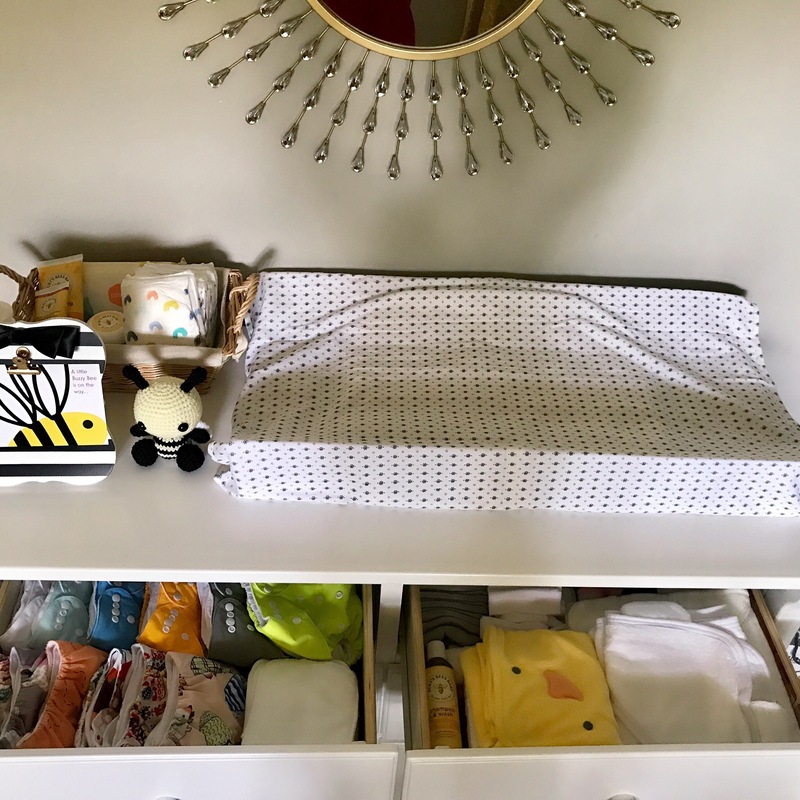 I didn’t want a changing table because I felt like it would eventually be outgrown. 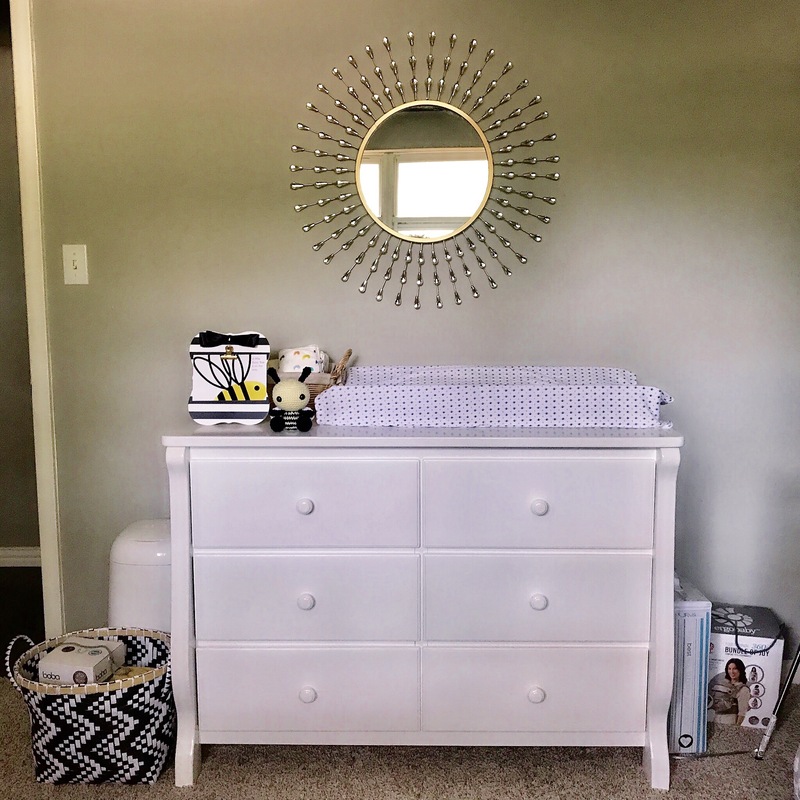 To save on space, we doubled her dresser as a changing table. It’s perfect because in the top drawers I stashed her cloth diapers, towels, and wash cloths for easy access. 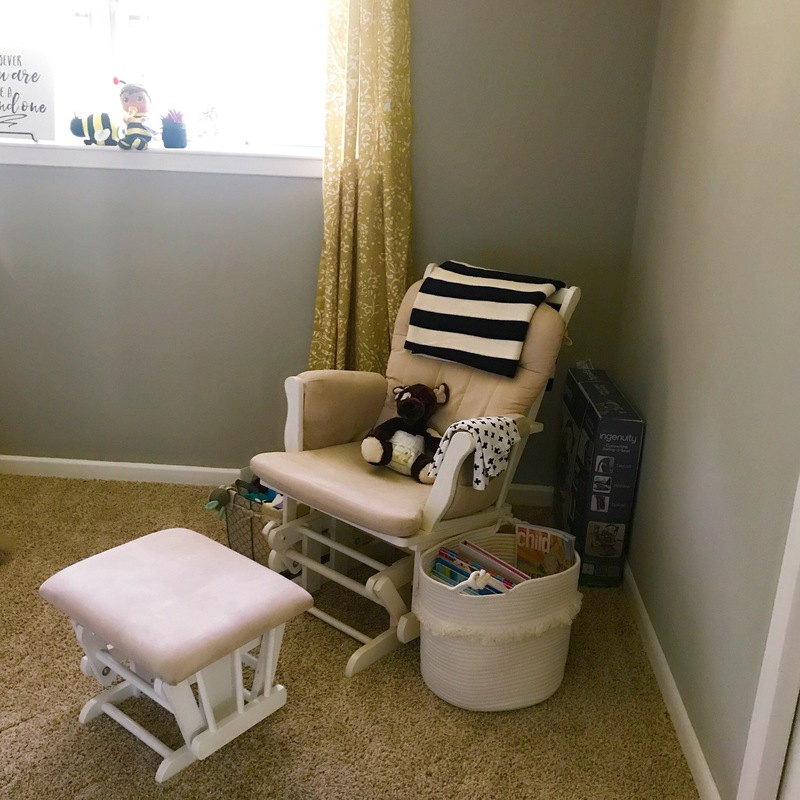 I also had space for a table top basket for her little eco friendly diapers, wipes, etc….maybe I should throw in some bio hazard gloves and a face mask lol! The centerpiece of the station is easily this sunlike mirror I found for a deal at Burlington Coat Factory. I thought it was the perfect touch to open up the room and provide some simple glam wall decor. 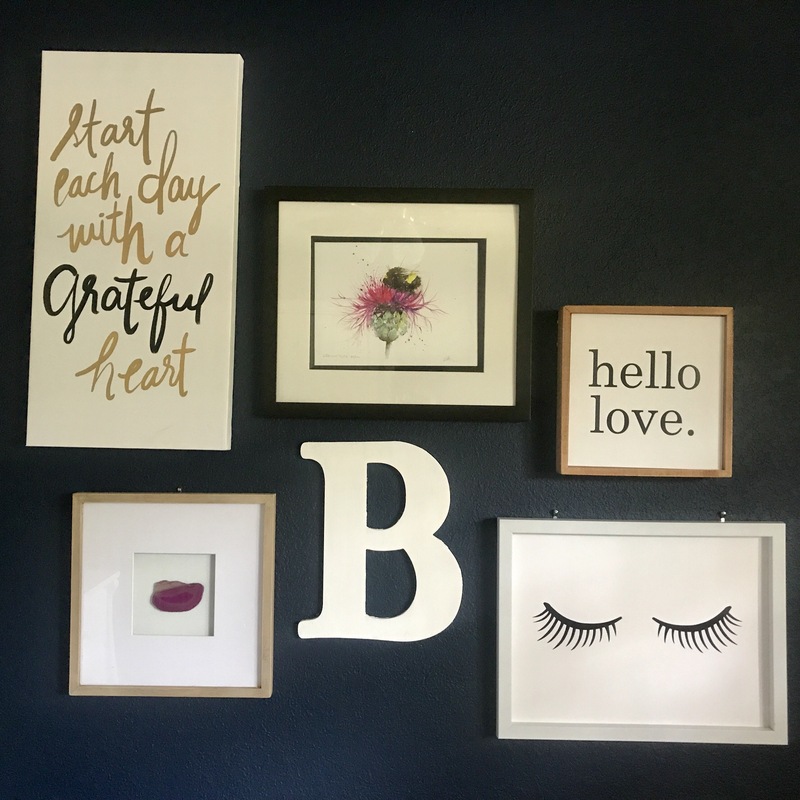 We chose a Calvary Blue accent wall painted by my lovely hubby and a collage of fun art I found and received from various places. My most favorite is this limited edition water color print from artist Jen Buckley Art on Etsy “Bumblebee On A Thistle”. I just love it! 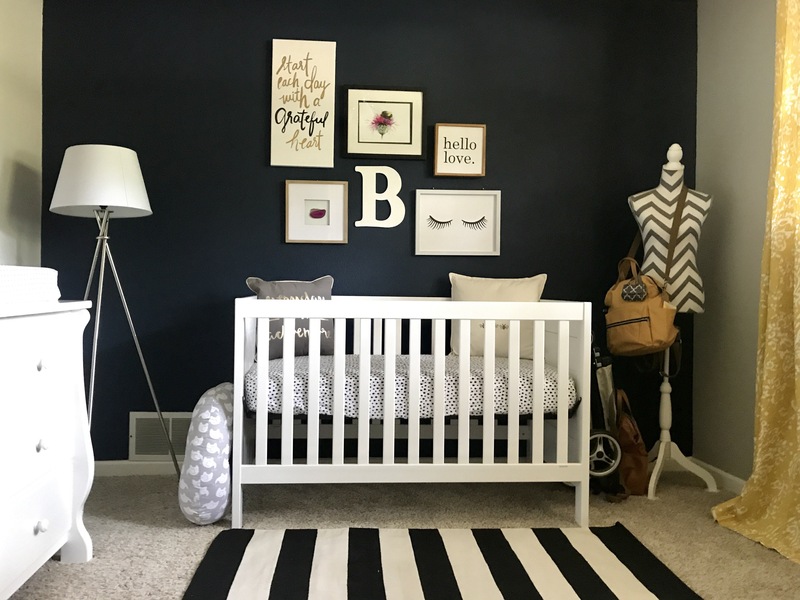 As soon as I saw it I knew I wanted to build our daughters room around it. Accents to the crib ended up being a tripod floor lamp and the styling mannequin I use for my Poshmark biz. The lamp was about $30 from Hayneedle and I just knew I couldn’t pass it up. 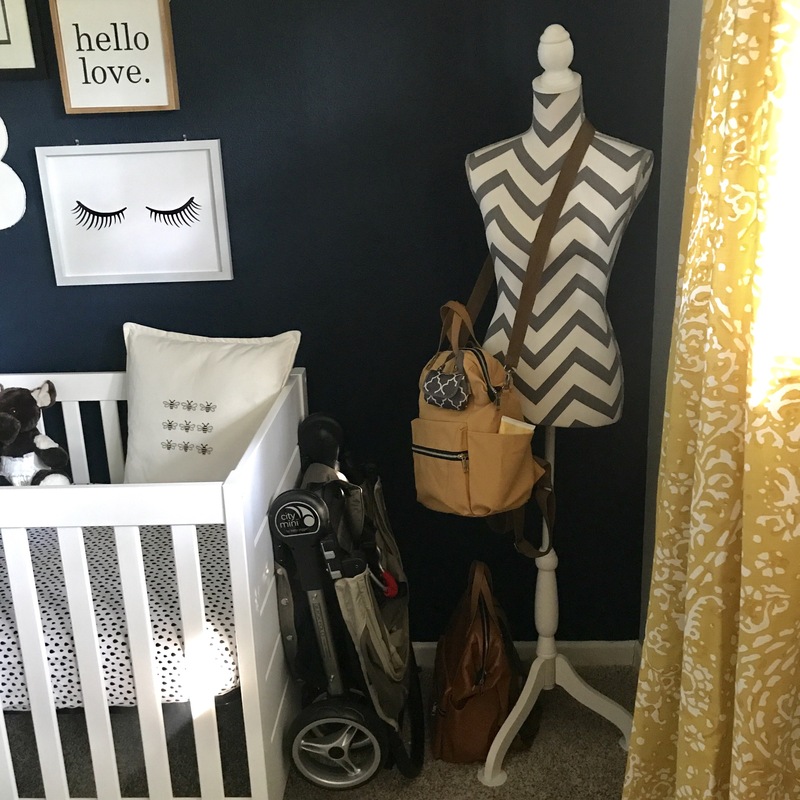 The mannequin wasn’t originally supposed to live in the nursery but it also functions as my handy diaper bag holder for now so she can stay for a bit. I’m assuming this kid will enjoy reading like I do. When I was a kid I used to LOVE reading cereal boxes and even until this day I still do (however my reading tastes have evolved as well). We already have a nice stash of books going so there will be plenty of bonding moments over books. Annnnd to help with that bonding is our lovely rocker glider chair. I had no idea that rocking chairs were so pricey! Anyone that knows me knows I believe in bargains. Thankfully I got this glider for a steal! Seriously, $70 on 5mile for the chair and matching ottoman! 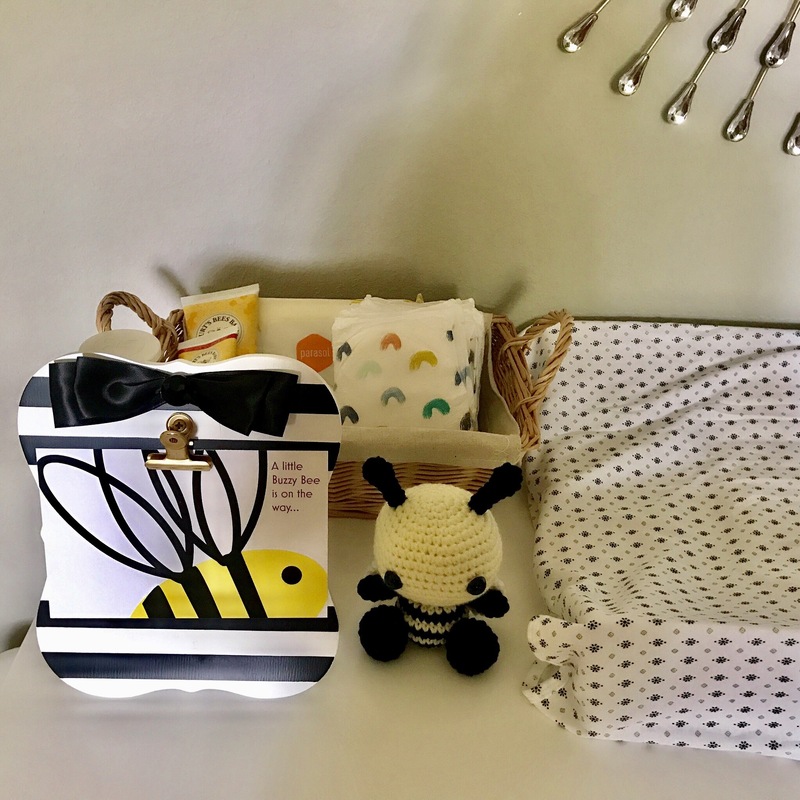 And as a perfect accent touch my Auntie sent me a black and white stripe blanket to cozy up with our Little Bee. Well that’s basically the whole room. I hope you enjoyed the tour. To be honest I’m kind of thinking of redoing our own room based on how well this turned out lol! Anywhoo, now all we need is a baby to put in there and we are good to go! So cute and stylish. So happy for you!